Apologies for the silence, but there simply was no time to post until today.. Even though I've been cooking up a storm lately for friends, family and food shoots, I somehow never got around to posting after cooking.. or eating! I got home quite late today, and Phiras made delicious Chicken Fajitas for dinner with some left over chicken breasts in the fridge. It was absolutely yummy, but what put an even bigger smile on my face was the fact that he used leftovers. There simply isn't anything as satisfying as using up all the food you have, because no matter how much I love going to the market - I hate nothing more than wasting food..
Oh and to make up for my two week blog break, I have some very exciting news to share soon inshAllah.. In a saucepan, heat the vinegar and a little cracked pepper. When almost evaporated, add the yolks and whisk continuously until you have a creamy consistency. Remove the saucepan from the heat and add the butter slowly while continuing to whisk. Put it back on the heat and finish with lemon juice, thyme, seasoning and set your sauce aside. In a pan, heat a little butter and olive oil and sauté the spinach for a minute, just until it wilts, season and set aside. In the same pan add a knob of butter and sauté the scallops for a minute on each side, until they turn golden. 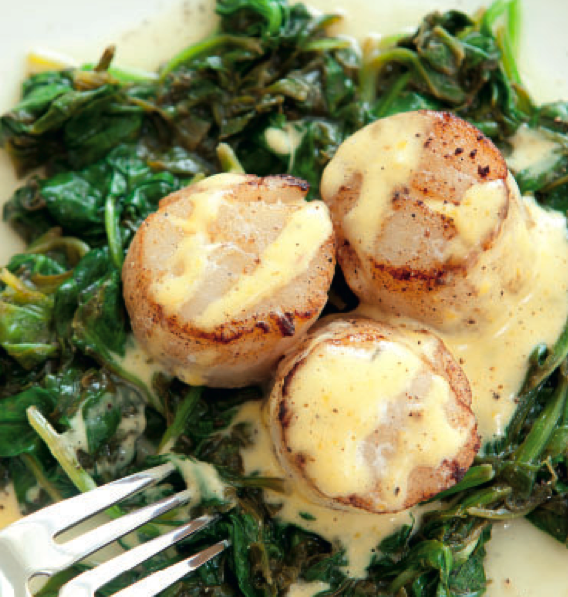 Season to taste, lay on top off the bed of spinach and drizzle with the hollandaise.